Add the Milwaukee M18 FUEL 5 Tool Combo Kit to your cart. The free item to be chosen in checkout, and will automatically be discounted in your cart once both the qualifying item and the free item have been added. Valid on select items, qualifying items are identified on the product page. Offer valid until 11:59pm ET on April 30, 2019 or while supplies last. Limit 2 free items per customer. No adjustments to previous purchases. Subject to change without notice. The world's first cordless grinder delivers the power of a corded grinder with up to 2X more run time and up to 10X longer motor life. The M18 FUEL 4-1/2 in. / 5 in. Grinder supplies maximum sustained power to complete the toughest grinding, surface preparation and cutting applications. The POWERSTATE Brushless Motor provides up to 10X longer motor life and lower cost of ownership. 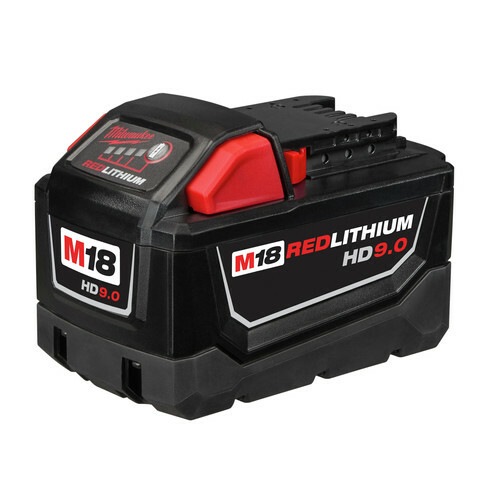 The M18 REDLITHIUM XC5.0 Battery Pack (not included) delivers up to 4X more run time and 20% more power. The grinder features REDLINK PLUS Intelligence, the most advanced system of cordless power tool electronics, for maximum performance. 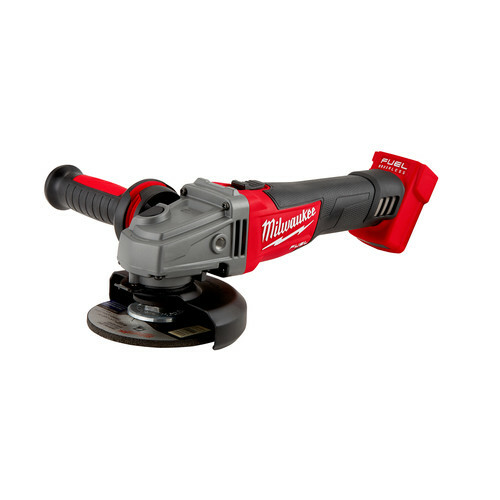 The 18V lithium-ion grinder's thin body design gives it optimized balance to rest easily in your hands. Tool-free accessory changes and guard adjustments mean less downtime during work. 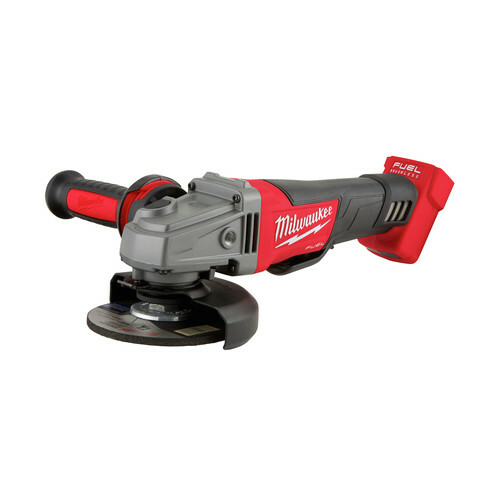 The grinder is built with the same tool body, gearing system and anti-vibration side handle as Milwaukee's legendary high-performance corded grinders for maximum durability on the job. Grinding wheel sold separately. In the month that I've owned this I've probably put 20 hours of solid grind time on this. I've used it to grind welds on a bumper project, strip paint on sheet metal, and cut through 1/4 inch steel plate. This thing has done it all. This doesn't have the RPMs of corded versions but this also doesn't vibrate your hands to death. I can use this thing 30 minutes nonstop without getting fatigued in my hands whereas I use a corded Metabo and my hands hurt from vibration and the weight of the tool after only a few minutes of grinding. This thing is lightweight and plenty powerful for the backyard mechanic or the small project fabricator. This thing does go through batteries fairly quickly. I get about 20-30 minutes of solid heavy duty run time out of a 5 amp hour battery. My 9 amp hour battery can go 45 minutes and seems to put down even more power. Wonderful tool. Already had a battery for this unit for my 1/2" impact wrench. My old blue Ryobi grinder has more stamina than this thing even with the 9.0 HD battery. Have several M12 and M18 tools to include this and the weed eater which all work very well. However, the M18 Fuel Grinder has been a huge letdown. Started building a smoker and needed the grinder to do some metal fabrication with a cutoff wheel and a 80grit flap wheel. Even with the 9.0 battery attached, it would cut out and I would literally have to rev up the grinder with the flap wheel to get it started again which would last for 1-2 min of grinding and it would cut off again. Eventually gave up and pulled out my old blue Ryobi with a 4.0ah lithium battery to finish up. Bringing it back to HD to see if they will swap it out. If so, I will update accordingly. Plan on spending many hours on scaffolding working on old brick. 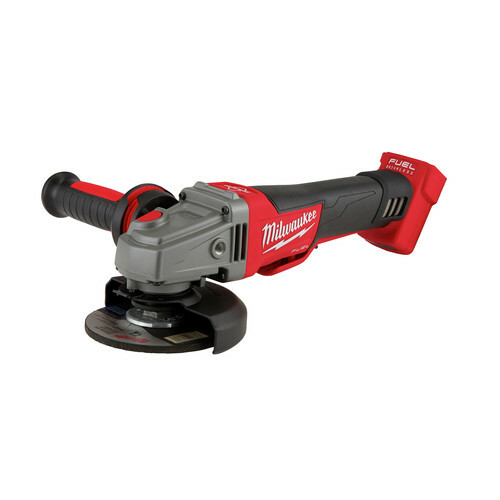 Look forward to hours of no power cords needed with a Milwaukee 18 volt right angle grinder. I love the convenience of this tool, much more safe than tugging a cord around behind you. The only issue that I have with it is that it goes through batteries very quickly. if these are so good how come they have recondition ones already ? Does it come with a case or bag? BEST ANSWER: The item will not include any case or bag. 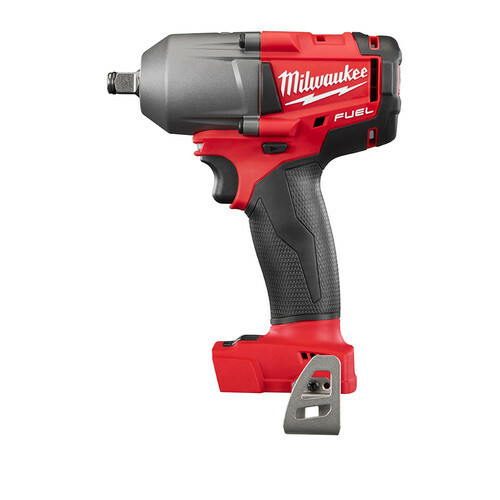 I believe Home Depot does authorized Milwaukee service; If the HD store doesn't have a tool repair in-house, they ship it to the regional repair center and it's typically back at the store you dropped it off at within 2 weeks. Most HD stores with Tool Rental DO have a tool repair on site, by the way. Hope that helps! BEST ANSWER: Milwaukee offers a 5 year warranty on this tool. I bought this tool to use on a log home sanding large pillar logs. Where can I find/buy the accessories to do the job? Sanding disks, backing pad, spindle, disc nut, etc?? BEST ANSWER: Please contact the manufacturer direct at 1-800-729-3878 for a service/parts center in your area. where can I find the flange nut kit for the milwaukee 18volt cordless grinder?